This page is about the oldest city in Ireland. For other uses, see Waterford (disambiguation). 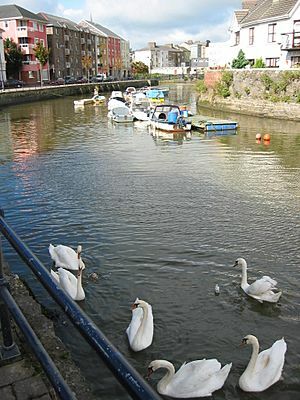 Waterford (from Old Norse Veðrafjǫrðr, meaning "ram (wether) fjord", Irish: Port Láirge) is a city in Ireland. It is in the South-East Region, Ireland and is part of the province of Munster. 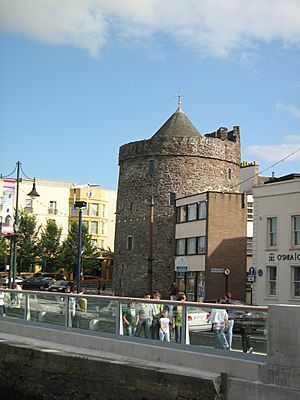 The city is situated at the head of Waterford Harbour. It is the oldest and the fifth most populous city in the Republic of Ireland. 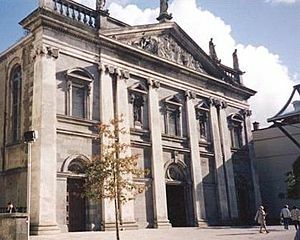 It is the eighth most populous city on the island of Ireland. 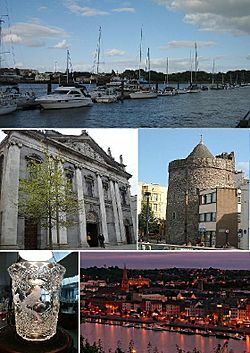 Waterford City and County Council is the local government authority for the city. Waterford is known for Waterford Crystal, a legacy of the city's former glass-making industry. . According to the 2011 Census, 65,928 people live in the Waterford Metropolitan District, however this figure does not include its suburbs in County Kilkenny and County Wexford. 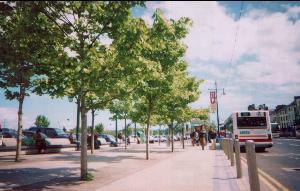 There are over 80,000 people within a 15 km radius of the city centre. With a population of 51,519, Waterford is the fifth most populous city in the State and the 32nd most populous area of local government. The name 'Waterford' comes from Template:Etymology/lang Veðrafjǫrðr, meaning 'ram (wether) fjord'. The Irish name is Port Láirge, meaning "Lárag's port". The Barrack Street Concert Band A band established in 1870 and is one of the only bands in Ireland to have unbroken service through a civil war and two World Wars. They have a long and rich history. In 1982 they changed their name to The Barrack Street Concert Band. The new name reflected a change in instrumentation including flutes,saxophones,oboes and a full percussion section which led to more members joining and a wider variety of music being played. 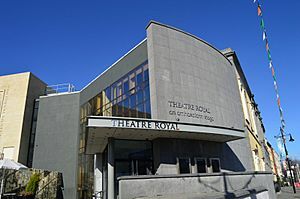 In 1994 the band won the All Ireland Senior Military Band Championships in Wesley collage Dublin under the Baton of Mr Niall O'Connor and 10 years later, in 2004, the band won the South of Ireland Senior Military band Championships in Clonakilty Co Cork under the Baton of the band's current musical director Mr Mark Fitzgerald. 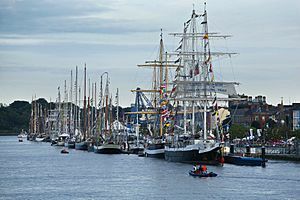 Tall Ships lined up on the quays in Waterford for the festival. 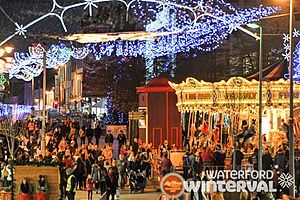 The busy scenes at Winterval Waterford, Irelands biggest winter festival. The Quays: "The Three Sisters" mix near the city before flowing into the harbour. 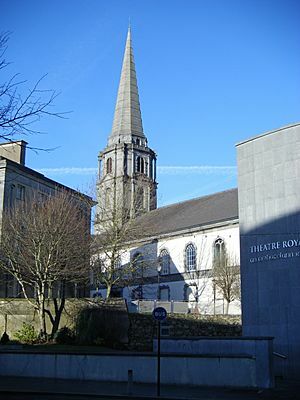 Cathedral of the Most Holy Trinity on Barronstrand Street. 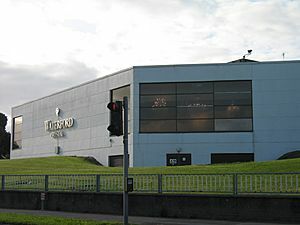 The old Waterford Crystal visitor centre which closed in late 2009. A new centre opened in June 2010. Car rental services in Waterford are offered by Europcar, Hertz, and Enterprise. Waterford Facts for Kids. Kiddle Encyclopedia.